Seriously, there should be some sort of achievement for wiping out an entire species! 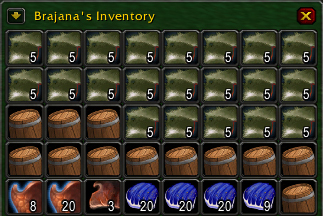 After a solid hour of farming Sholazar Basin, I’ve got 105x[Swatch of Gorilla Hair], 12x[Hefty Barrel], 69x[Chilled Meat] and a 28x[Heavy Borean Leather]. Nesingwary would be proud! However, I’m sure Hanno, my gorilla wasn’t very happy about all the carnage I put him through. Christmas: a time for giving thanks! 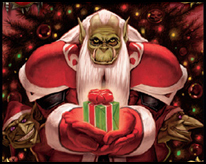 Even Orcs can be jolly! It’s that time of year, and due to visiting family and all that stuff, I probably won’t be playing much for the next couple weeks, until after New Year’s. I’ve got a couple posts I’ve been working on that I’ll try to get up in the meantime… but regular daily posts will probably not return until 2009! Before the break, I just want to give some thanks to everyone who makes this little blog possible. Thanks to all the readers of Mend Pet… I appreciate the time you take to read what I’ve written! When I started this blog a few months ago, I figured I’d be the only one reading (which would still have been okay), it’s nice to know I can ocassionally offer some help to others though! To my regular commenters – you’ve been just as much help to me as any other blog I read! Advice and tips are always appreciated. A great big thanks to my guild, Unemployed. They make the game what it is for me, and without them I’d probably have lost interest long ago! Special thanks to Pilsner and Guinesa for somehow managing to keep things running smoothly, and being great friends through tough times. To Tigerfeet for getting me into blogging in the first place, and always being an asset to both Shoutbox and any party that needs a tank! To Tharaks for always making sure I’m hungry with his food talk and blog, and also to Boostah, for being someone I can go to for hunter advice, no matter how silly the question is. Thanks to the other bloggers of the World of Warcraft community – there can never be too many! Active discussion of theorycrafting and roleplaying and gameplay in general are wonderful things to have, and you’ve made me both a better player and a better blogger! If you haven’t already, please check out my list of other people’s blogs to see some of the great things I get to read every day. I finally got around to updating my list of “Other People’s Blogs“. I’ve kept it split up the way it’s split in my Google Reader, the ones I check first, and then the rest I read as often as I can. My quondam list was a bit of a mess, lots of blogs that I don’t read anymore or have dropped off the face of the earth. It’s always sad to see a blog that hasn’t been updated in a month or two! Improved Aspect of the Hawk (5/5): Since I am BM, I am already technically haste-capped as far as Steady Shot is concerned, but I had to put 5 points somewhere. This will still speed up my auto shots, which is a big portion of my damage anyway. Endurance Training (1/5): I put just 1 point here because when I start going into the third tier, I will need a 10th point somewhere, and this was the most useful of my options. Focused Fire (2/2): There is no reason not to have this one – 2% damage increase and increased pet crit chance? Sign me up! Improved Revive Pet (2/2): I find this nice to have. Even though my moth does have Heart of the Phoenix, there are some fights where he dies more than once, and I don’t like not having him around, too many buffs depend on him! Aspect Mastery (1/1): The increase to Hawk and the decrease to the Viper penalty are wonderful. Anything that makes Viper hurt me less is a plus in my books! Unleashed Fury (5/5): Yes please. Improved Mend Pet (2/2): I’ve noticed that a lot of people only put 1 point in this, but I prefer to put 2. My mana is important to me, and it saves me a couple hundred mana. I may take points out of this if I find I’m not using Mend Pet enough to justify it. Ferocity (5/5): This is again a staple of the Beast Mastery tree. More crits mean more Ferocious Inspiration and more Frenzy! Intimidation (1/1): I don’t use this a whole lot in raids, I might try to use it as an emergency interrupt on trash, but it’s not very reliable since it is an “on next attack” deal. But this point is necessary nonetheless, because of what depends on it. Bestial Discipline (2/2): More focus means more hits, more hits mean more crits, and this all adds up to a decent upgrade in DPS. Animal Handler (2/2): This is one that I’d never really thought to put points in before. It has changed, but what does 10 Expertise have to do with me? And I don’t really ever use Master’s Call! But then, I learned that Expertise improves my pet’s hit. And considering how horrible my hit seems to be right now, any help would be much appreciated there. If my pet can’t hit, he can’t crit! And regarding Master’s Call: the fact that I never use it isn’t the ability’s fault, it’s my own. I need to learn when it can be used and remember to actually DO it. Frenzy (3/5): Frenzy is another basic BM talent, but what is debated is how many points are really necessary. I’ve run with 4/5 for a very long time, and it seems I’ve got Frenzy up almost constantly. I put 3/5 this time as a bit of an experiment, to see how much uptime I can get with just 3 points. If the difference is negligible, I’ll keep that extra point for somewhere else! Ferocious Inspiration (3/3): An essential raiding talent. This is almost always up, due to the high crit rate of my pet, so it’s pretty much a constant +3% damage buff for my whole party. Rock on. Bestial Wrath (1/1): Big Red Moth! Serpent’s Swiftness (5/5): This is what makes us Steady Shot haste-capped. This is one of the reasons my pet crits so much. This is the frosting on the BM cake. 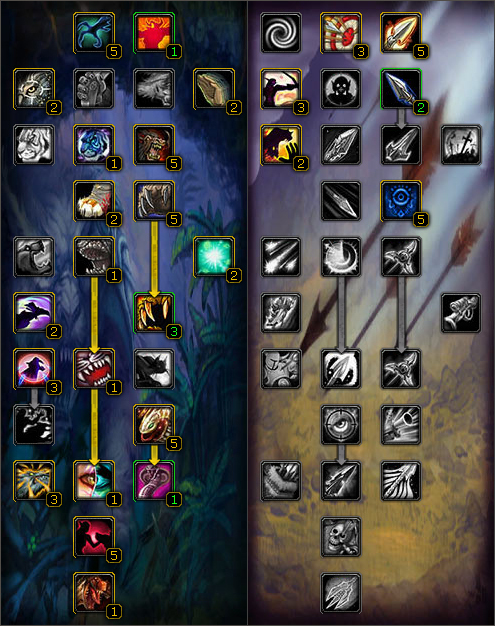 Longevity (3/3): With this and the talents in the pet tree, my Bestial Wrath cooldown is about 68 seconds. That’s nearly half of the original. Considering Bestial Wrath lasts for 18 seconds, Ambrose and I are big and red over 26% of the time! Wow! It doesn’t get much better than that. The Beast Within (1/1): Big Red Brajana! Cobra Strikes (1/3): This is my spare point from taking 3/5 in Frenzy. I’m still unsure of where to put it. My options are Cobra Strikes, Spirit Bond or Invigoration. I decided on Cobra Strikes because it goes hand in hand with the point taken out of Frenzy, it helps built my pet’s crit, so Frenzy is more likely to happen anyway. Kindred Spirits (5/5): The simple damage increase talents are always nice. 20% damage increase is a huge boost. Beast Mastery (1/1): This talent seems to be much debated. Some say there’s no point in taking it if you’re not running with an exotic pet. Others say the 4 extra pet talent points just aren’t worth it. I was a little split on it before, because the choice was between this and Readiness for me. But with the new patch up and coming, Readiness doesn’t really have much use for me. So I decided to go for the extra talents. Focused Aim (3/3): Due to my miserable hit rating, this is a must for me. The pushback resistance is nice as well, although I don’t know if I’d put points here just for that. If I find myself at a more stable hit rating, I may begin to shift points out of this and shove them somewhere else. Lethal Shots (5/5): I can always use more crits. Careful Aim (3/3): A free 322 RAP? How could I say no to that? Mortal Shots (2/5): From what I understand, this no longer affects Steady Shot auto shot, so it’s not as useful as it used to be, but it’s still nice to have. I’ve put 2 points here to help me get to the next tier as well. Go For the Throat (2/2): Like Bestial Discipline, more focus regen means more hits. You can never have too much focus! Efficiency (5/5): I’ve had mana issues, and had to spend a lot of time in Viper. This, in addition to my other Viper improving talents, helps me do maximum DPS longer than otherwise. I know this isn’t necessarily where everyone would put their points. I know it may not be the optimal spec as provided by Elitist Jerks or Big Red Kitty or something, but this is what I’m working with right now. While I am a bit disappointed in my DPS output, I don’t think it’s due to how I’ve spec’d! Where has all the hit gear gone? Finally got in to my first Naxxramas raid last night! It was fun, and very quick paced as I was expecting. I picked up two new pieces of gear: [Rusted-Link Spiked Gauntlets] and [Wraith Spear]. But when I equipped them… my hit rating drop to 106. Pathetically low. So I went through all my gear to figure out what was going on… and it seems that every time I get an upgrade, I lose hit rating. My quondam gear, from before heroics and raiding, had me nearly at 200. I’ve got + hit on my 2x[Savage Cobalt Slicer] (which will soon be nerfed) and my [Gilt-Edged Leather Gauntlets], both of which I was trying to replace with my new Naxx gear! Other than those, all of my hit is from BC gear. Every other Northrend piece I have picked up has absolutely NO hit rating! What’s a Troll to do? I guess I’ll have to decide which items I should keep for the hit, even though it hurts me inside to just through away agility and attack power and all that other good stuff. Hopefully I’ll get more lucky with drops, or at least figure out where everyone is getting all this gear that puts them over 200! I also discovered that I’m sorely disappointed by my DPS output. This calls for massive test dummy action later this week or over the weekend. Hopefully I will be able to report better numbers after investigating, or at least be able to ask for advice and provide details of what’s wrong.